Karachi: Scores of leaders and workers of the Pashtoon Tahaffuz Movement (PTM) have been arrested by the Sindh police under anti-terrorism laws after they organised a rally on the outskirts of Karachi in Pakistan, officials said on Tuesday. According to senior police officials, the PTM leaders and workers were booked for resorting to "undesirable language against state institutions" at the rally held at Sohrab Goth here. An FIR was registered by the state through Sohrab Goth Station House Officer Rao Zakir, they said. The PTM is a social movement for Pashtun human rights based in the Khyber Pakhtunkhawa and Balochistan. 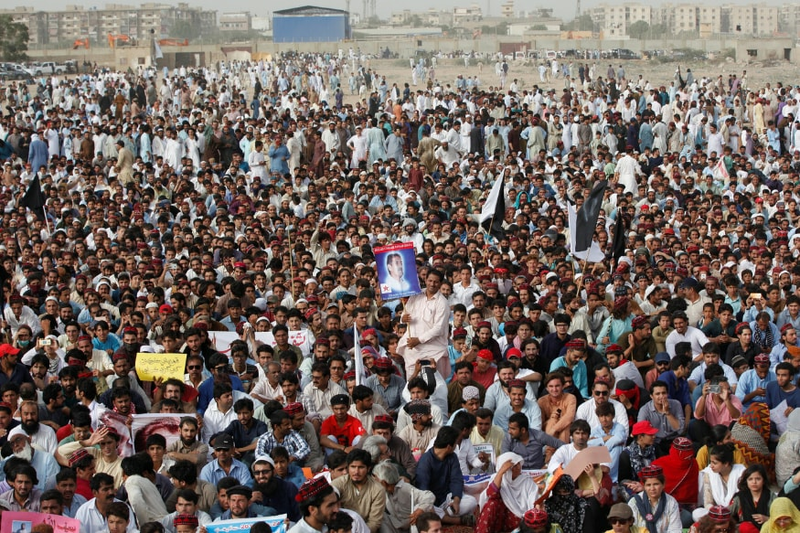 "The workers of the PTM under directions of Manzoor Pashteen organised a rally at a ground and when the complainant SHO rushed to the scene and asked the PTM president of the area, Naurazay Tareen, to show relevant permission documents, he became jittery and created hindrance in official work and chanted slogans against state institutions and police," reads the contents of the FIR. Police alleged that the organisers did not listen to the SHO and spread provocation, "creating an atmosphere of serious fear and chaos". Police invoked various sections of the Pakistan Penal Code and 7-ATA (Anti-Terrorism Act) against 250-300 persons, including 16 identified by name. Earlier, North Waziristan MNA Mohsin Dawar, who is a top leader of the PTM, in a tweet claimed the arrest and subsequent disappearance of Alamzeb Mehsud, described as an active member of the PTM and a campaigner for missing persons. The lawmaker said the young man's arrest was the latest in a series of incidents involving Sindh police and security agencies harassing PTM workers and activists following the party's successful rally in Karachi on Sunday. Dawar demanded the immediate release of Mehsud and other PTM workers. The regional chapter of Amnesty International also expressed concern over the disappearance of the PTM activist. "We are concerned about reports of the disappearance of PTM activist Alamzeb Mehsud. His whereabouts must be disclosed immediately. Either produce him in court or release him without delay," read a statement issued by the human rights watchdog.